Never clean out your gutters again! As the rainfall approaches the end of the LeafOut product, it is captured by the S-Shaped design. LeafOut has a multi-rib panel that slows the rain water as it nears the gutter. As the water approaches the end of the product, it follows its surface and enters the gutter. LeafOut’s unique nose-forward design allows water to easily flow into the gutters, but blocks leaves and debris. The Rhino Gutter Guard is made from durable expanded aluminum that will not rust, rot, or deteriorate. Diamond shaped holes dissipate water quickly and effectively. 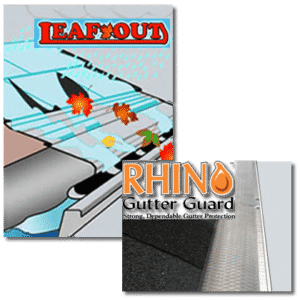 With the Rhino Gutter Guard you will encounter fewer failures, a larger amount of water dissipation and a greater ease of self-shedding than any other comparable product on the market. Superior Seamless Gutters is an authorized installation expert for this product in Rockland County, NY and Bergen County, NJ.